So, in short, you must get your business recorded by video and publish it on the internet, both on your website and on YouTube. And, fortunately, we can do this for you. Give your clients a tour of your business from the comfort of their own desktop. Linked to Google Streetview and maps, a 360 tour is the perfect way to showcase your premises. 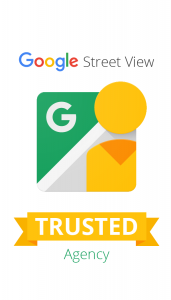 As a Google approved 360 supplier we can create a virtual tour using our specialist camera equipment. The process creates minimal fuss and also helps with your SEO efforts.